The Raiders had it all in front of them Sunday, building a double-digit lead, but allowing touchdowns to the Bills offense on all five of the Bills’ second-half possessions and failed to hang on to what seemed an insurmountable lead. Oakland led 21-3 at the half, and then went up 35-31 with 3:41 left, but it wasn’t meant to be as Ryan Fitzpartick and the Bills did enough in eventually scoring a game-winning TD with :14 left to take home a 38-35 win. David Nelson caught a six-yard touchdown pass for the game winner from QB Ryan Fitzpatrick. The Raiders had a last chance, and it looked like Jason Campbell could have pulled off a miracle, Da’Norris Searcy picked off the hail mary pass in the end zone. Campbell was 23-for-33 for 323 yards with two touchdowns and a pick. 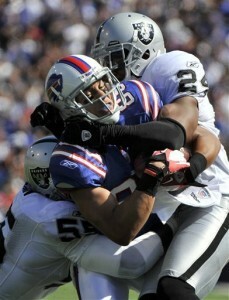 He also ran in a touchdown for the Raiders, who were outgained 484 to 451 by the Bills. Fitzpatrick ended 28 of 46 for 264 yards and three touchdowns, while running back Fred Jackson scored twice. Darren McFadden ran for 72 yards and a score on 20 carries, while catching seven balls for 71 yards and a touchdown for Oakland. With Raider playmakers Jacoby Ford, Louis Murphy and Darrius Heyward-Bey out with injuries, Moore exploded for 146 yards on five catches, including an amazing 50-yard touchdown grab in double coverage. 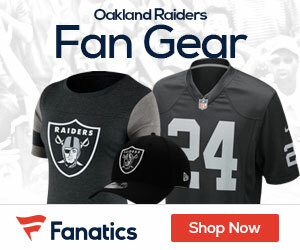 The 38 points were the most allowed by Oakland in a loss since a 43-37 defeat to Seattle in 1998. And they allowed 481 yards—326 in the second half— and 34 first downs. According to STATS LLC, the Bills became the first team to score touchdowns on all five second-half possessions since it started keeping track of such things in 1993. On those drives, the Bills piled up 366 yards on 40 plays. In doing so, the Bills overcame a 21-3 halftime deficit and improved to 2-0. They have scored 79 points in two games. It should have been a happy day for the Raiders, who should be riding a two-game winning streak. Instead, now they have to quickly regroup and get ready for a home game against the New York Jets Sunday. Tell me, how does a team give up 35 in the second half and nobody is fired, cut, or benched? How is it a team gives up 35 in a half and nobody is fired, benched, or cut?